PhoXo is a very lightweight, yet capable image editing application which is small enough to fit on a small disk and yet also able to run fine of lower-end systems like netbooks. The main interface of PhoXo is rather reminiscent of other image editors with a main canvas and other panes reserved for other functions like layers and tool on the left-hand side. Like Adobe Photoshop or other high end graphics editing applications, PhoXo thankfully supports layers, masks and exemption features. With PhoXo, you can perfect simple photograph touch-ups, add text to images, add some included clip-art and more. Version 8.3.0 is a freeware program which does not have restrictions and it's free so it doesn't cost anything. 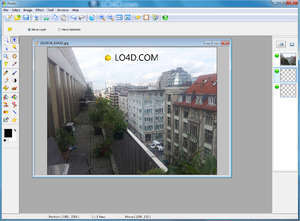 For security reasons, you should also check out the PhoXo download at LO4D.com which includes virus and malware tests. Additional screenshots of this application download may be available, too. Download and read reviews on some of the very best image editing software today with access to some of the best names such as Corel, Adobe, Photoshop and ACDSee! Check out some of the freeware downloads available in the image editor category. They contain no strings and are available at zero cost. PhoXo has a presence on social networks.